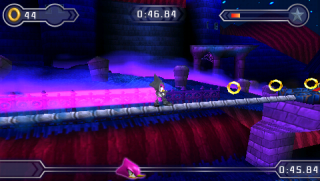 Mystic Haunt Zone is the fifth level of Sonic Rivals 2 for the PSP. Set amidst a sprawling, haunted mansion, the Zone contains three Acts plus a boss fight at the end. As with most of Rivals 2, the Zone is located somewhere upon an unnamed island in Sonic's world. Predictably, the area is rather spooky. Whether it's the collapsing vertebrae-styled floors, the acres of graveyard real estate outside, or the moonlit branches of trees invariably arrayed in the shape of withered hands, Mystic Haunt Zone is designed to send a shiver down the spine. The level also features ghosts which pursue the characters as the lights dim; hop on a switch to temporarily dispel them, a la Sandopolis Zone. There are also a great number of teleport vortices to navigate, on top of switch-activated doors where you have to match the symbol (a skull, ghost, or tombstone) to another one displayed on the opening mechanism. Sonic and Tails are confronted at the very beginning of the Zone by ghostly simulacra of themselves. Defeating these malevolent shades is the work of their Acts 1 through 3. At the boss, Sonic (still unaware that they've been pursuing a disguised Eggman Nega) attributes "Eggman"'s strange mannerisms to ghostly possession. Knuckles is led to Mystic Haunt by Rouge, who's been directed there by her mysterious client. Once again, the emerald detector runs out of rings, so Knuckles races off to find more. Rouge spots Espio, who she misconstrues as the person who hired her and sets off in pursuit. Shadow and Metal Sonic, approaching the area, are informed by Robotnik that the Zone (as with Sunset Forest) will make it difficult for him to relay orders. The fat man orders Metal Sonic to pursue Knuckles and Rouge, determined to prevent the bat from collecting all the Chaos Emeralds for Nega. Shadow, meanwhile, races to find Mystic Haunt's gem before Rouge does. Silver and Espio, having been informed by an overconfident Nega that the sacrificial chao are hidden somewhere within the spooky mansion, spend their time searching the area for the otherwise-doomed creatures. They are eventually unsuccessful, but only because Sonic rescues them first. This page was last edited on 6 March 2018, at 00:10.